HIGH ALTITUDE ORGANICS TM Arnica Montana Oil Extract is 100% Pure and Potent. The active ingredients from Arnica Montana flowers, wild crafted in Germany, are uniquely extracted into organic Soja Hispida oil. The extraction of the Arinca is a long and costly 3-week process. Our Arnica Oil Extract is effectively used for relieving pain associated with muscle aches, sprains, and proven to soothe sore muscles. It is beneficial for treating bruises and insect bites, and for reducing inflammation. Arnica oil is used to treat swelling due to sprains and fractures. Arnica may be beneficial for treating acne, boils, cuts, scrapes and rashes, dandruff. Less than 1% of Vitamin E and Rosemary Extract are added to prevent rancidity...Enjoy... NOTE: Our Arnica Oil Extract is produced every week and comes to you fresh from production. This is NOT a Essential/Volatile oil (you will not find essential oil of Arinca on the market, as it is toxic). Out Arnica oil extract is the SAFE alternative. 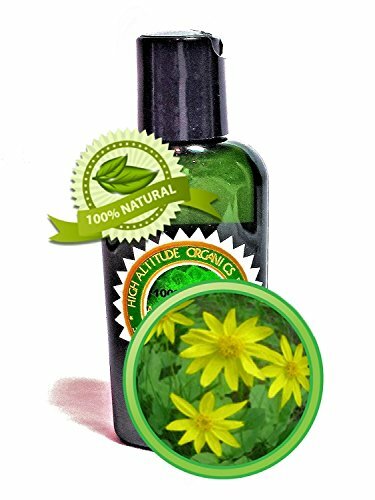 Arnica Oil Extract (Arnica Montana) - 4 oz/120 ml- Pure and Potent- Anti-inflammatory for Sore Muscles, Bruises, Sprains, Fractures, Natural Pain Remedy, Sunburn, Post-Surgery Bruising.